Wye Sue Knits and does other crafty things in the middle of Herefordshire. Can you see my Melons? Mr Mole - hands and nose - oddment pink double knit. About three or four handfulls of toy stuffing. All knitted with 3.25mm needles. Worked in the round on 3.25mm double pointed needles. Cast on 9 stitches loosely, divide between three needles 3 stitches per needle. Draw thread through the stitches and pull tightly, fasten off. K2tog four times. 4 sts. Using 3.25mm needles and black plume cast on 24 stitches loosely. Knit to end of row. P2tog three times, Purl 1. Break thread and pull through stitches and sew up nose and fasten off. Sew up seam using black plume. Attach arms to top of hill pointing forwards as if digging. Lightly stuff body and sew on to hill over ends of arms and enjoy. What is it about Moles? They are just so cute! Your pattern is great Sue, really life like!!! Thank you very much for this pattern it is really cute. 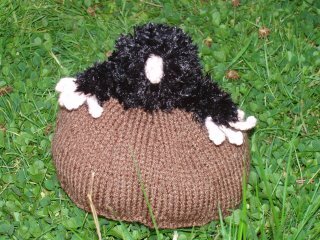 I look forward to knitting Mr Mole. He is adorable ! Thanks for being generous enough to share for free.